What does the internet smell like? Kittens, Bieber and shame? 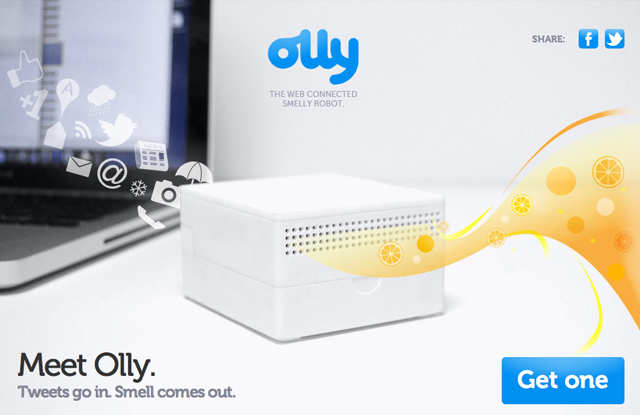 Well now a new device called Olly lets us smell the internet, or at least assign smells to things that happen on the internet, which will probably be a much more pleasant experience. The innovative new device dreamt up by the clever minds at Mint Digital’s Foundry uses an event on the internet, such as an @ mention or a new email, and then turns that into a fragrance (kind of like a super intelligent Glade poofy room aroma thing). Olly is powered by USB, so it sits right next to your computer waiting to infuse your room with whatever scent you’ve filled it with at the back. According to The Next Web, for now you can only have one smell for one kind of notification, but they can be stacked up so an @ can mean a refreshing Apple smell and a new email could mean tangy lemon. The Olly isn’t available to buy just yet, but you can sign up to be notified by the team at Mint Digital so you’re the first to know when it is. If you’re feeling ambitious and would rather make an Olly yourself, then all of his parts and code are open, so you can follow a number of step-by-step instructions.